Limited Edion pieces number 598 and 600 of 1000 pieces. 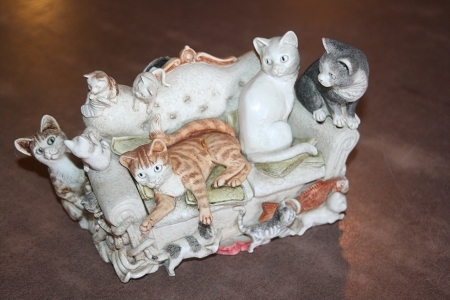 This is a wonderful collectible piece for a cat lover. You could stare at the piece for hours with all that is going on. Pictures tell the story better than words. S e c r e t s We last met Mrs. Bloomsbury Barton when a number of cats had taken up residence in her bureau. After an elegant soiree at Lady Pilington’s in Belgravia, Mrs. B-B believed that new furnishings were in order for her own Barton’s End. In due course, a large van pulled up to her provincial home and dropped off a davenport, which was soon taken over by Rex, Rover of the Sea and immediate monarch of the sofa. Rex made frequent excursions to the briny sea, and returned from one such escapade with supplies for his clan in the form of a sack of freshly caught fish. Hiding booty in the sofa cemented his status as hero, and soon he felt confident enough to invite his numerous nieces and nephews to leave their humble sailboat home to join him in the new palatial surroundings. Pre-Order - This item will be available on 5/28/2019.